LAKEVILLE, IN. 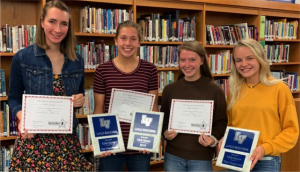 – The LaVille girl’s soccer team held its annual awards recognition. The Dan Zeiger is given in honor of school board member and long time soccer coach and advocate, Mr. Dan Zeiger. The Dan Zeiger Award represents a player that is a team player, has solid practice attendance, hustles, and gives it there best no matter what. Senior Kelsey Aschenbrenner led the Lancers with nine goals this season, freshman Kylie Gorka had seven goals, and Cory Hess and Zeiger added six goals each. Freshman Kassi Watts led the Lancers with six assists and Aschenbrenner added four. The Lancers finished the regular season with a 9-9 overall record. *copyright – This story and/or picture(s) may not be retransmitted/reprinted without the consent of www.lavilleathletics.com Please contact Scot Shearer at LaVille Jr-Sr High School, social media director.